UPDATED: Sat., April 28, 2018, 5:03 p.m.
RALEIGH, N.C. – Efforts to unravel the mysterious fate of North Carolina’s fabled Lost Colony could benefit after a preservation group took out its first-ever loan to buy a coastal tract where some colonists may have resettled hundreds of years ago. The 16th century English colonists who vanished after being left in the New World have piqued popular imagination and intrigued historians for centuries. One North Carolina community is even holding a Lost Colony Festival this weekend. The preservation of land linked to their disappearance could enable future researchers to shed new light on the historic riddle. The 1,000-acre property is so special historically and ecologically that the North Carolina Coastal Land Trust decided to take a risk and borrow $5.3 million for a real estate deal, said Lee Leidy, attorney and Northeast Region director for the trust. It’s the first time in 26 years that the trust has done so. The trust plans to turn the property over to the state, eventually, preserving it for future study. “It was a veritable time capsule of important historical events,” Leidy said. In addition to being the place where historians now believe some of the colonists resettled, the land in rural Bertie County has been home to an Indian village and to the plantation of Gov. Thomas Pollock, who served two stints as governor in the early 1700s. The land, which includes 3.5 miles along Salmon Creek, is important ecologically, with flood plain forests of cypress-gum swamp and bottomland hardwood forest. The military also uses the area as a central training route and supported the preservation, Leidy said. The nonprofit trust, which has preserved almost 70,000 undeveloped acres since 1992, purchased the land last year and plans to pay off the loans with money from grants. While there’s no specific timetable for turning the property over to the state, an official from the N.C. Division of Parks and Recreation will visit the site May 14, Leidy said. England’s ill-fated first settlement in North America was established in 1587, when 116 English settlers landed on Roanoke Island in what is now North Carolina, led by explorer John White. He left them there when he sailed back to England that same year for more supplies. When he returned in 1590, delayed by war between England and Spain, none of the colonists remained. White knew the majority had planned to move “50 miles into the maine,” as he wrote, referring to the mainland. The only clues he found about the fate of the other two dozen were the word “CROATOAN” carved into a post and “CRO” lettered on a tree trunk, leading historians to suspect they moved south to live with American Indians on what’s now Hatteras Island. 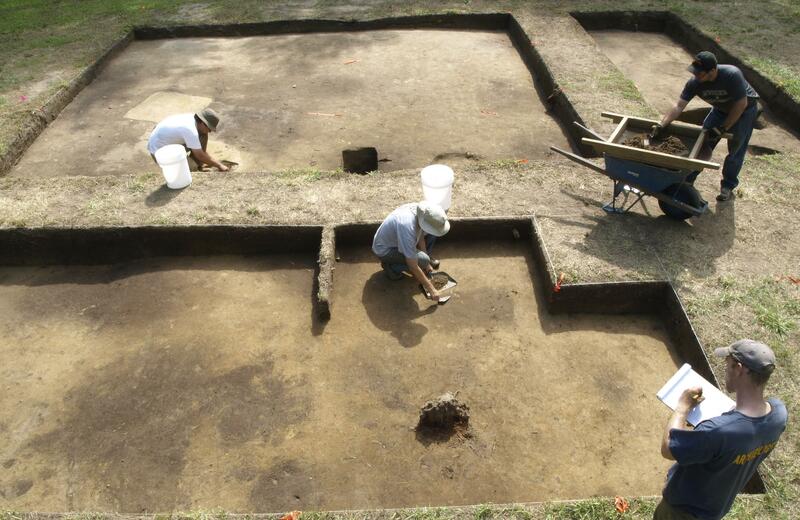 Archaeologists now believe that some found their way to the land in Bertie County. The possibility first came to light in 2012, when researchers at the British Museum in London announced they had found a drawing of a fort that had been obscured under a patch on a map of Virginia and North Carolina drawn by White in the 1580s. The drawing placed the fort in an area of Bertie County where archaeologists have found colonial-era English pottery and signs of a Native American village. While the area is best known now for its probable Lost Colony connection, it has more pottery shards from the Indian village of Mettaquem than from the Europeans, said Nick Luccketti, co-vice president of the First Colony Foundation, the group spearheading the archaeological dig on a parcel known as Site X.
Luccketti and Evans believe perhaps up to 12 members of the Lost Colony settled on Site X, possibly as a watch party for incoming friendly or enemy ships. The remains of other small settlements or a single large one could be located nearby in areas where they haven’t dug, they said. Published: April 28, 2018, 1:18 p.m. Updated: April 28, 2018, 5:03 p.m.